When my foreign colleagues hear me say that the Philippines is struck by typhoons at an average rate of 20 times a year, I get the usual look of surprise. It is unthinkable to them that calamities can devastate a country so often. Most of them have never encountered a typhoon before. They just know about these weather conditions when they hear news of devastating episodes in the Philippines. 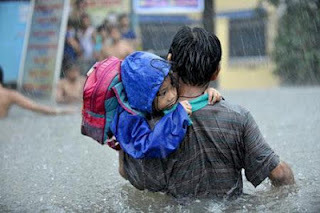 Filipinos, on the other hand, have accepted the reality of typhoons as part of nature’s wrath that we have to live with. We cannot deny their existence because they make themselves very real to us every so often. When I was still a kid, I was made aware of this reality. I did not expect that what I was going to witness was an occurrence that would leave an indelible mark to my memory. I was young then but old enough to remember how it felt like to be watching with horror the destruction of properties that dare to obstruct the typhoon's intended path. Seeing strong winds bring down your own home as you watch a few hundred feet away can be a really surreal experience. I remember watching my aunt crying out a suppressed sob of helplessness when her house lost its footing amid the ferocious typhoon attack. Our own home never succumbed to typhoons no matter how strong the winds were. I commend my father for consistently guarding against a possible devastation by installing reinforcements to our house every time we expect impending disaster. But not everyone has enough luck to avoid damages to property. Some would lose the fruits of their life's work without a fighting chance to prevent total destruction. Farmers can lose the source of their livelihood in an instant. These sad realities only bring to the fore the critical importance of weather forecasting in the Philippines. The capability to make timely and accurate forecasts has not been fully addressed until now. Several instances of inaccurate weather forecasts were blamed as cause for the failure to prepare for typhoons. The Philippine Atmospheric Geophysical and Astronomical Services Administration (PAGASA), the government agency tasked to make these weather forecasts, has been pushing for more Doppler radars to enable more accurate predictions. Their wish did not fall on deaf ears as three new Doppler radars systems with Japanese technology are now being built in Catanduanes, Samar and Cagayan. Initial validation tests of the Catanduanes facility produced "near-perfect forecasts" of rains in Albay. Forecasters predicted correctly 12-14 millimeter per hour of heavy rains that would be pouring at 10 AM until early evening. With these new Doppler radars set to operate in March, the more dependable weather forecasts to be produced by PAGASA are highly anticipated so that Filipinos will be better informed and more prepared. These investments in equipment by the government will potentially save lives and property. Return on investment would be quick many times over.